Wang, C.; Chang, W.-C.; Guo, Y.; Huang, H.; Peck, S.; Pandelia, M. E.; Lin, G.-M.; Liu, H.-w.; Krebs, C.; Bollinger, J. M., Jr. “Evidence that the Fosfomycin-producing Expoxidase, HppE, is a Novel Non-heme-iron Peroxidase.” Science 2013, 342, 991-995. Huang, H.; Chang, W.-C.; Lin, G.-M.; Romo, A.; Pai, P.-J. 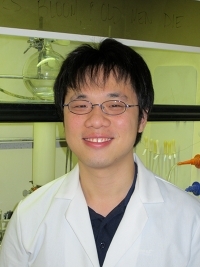 ; Russell, D. H.; Liu, H.-w. “Mechanistic Consequences of Chiral Radical Clock Probes: Analysis of the Mononuclear Non-Heme Iron Enzyme HppE with 2-Hydroxy-3-methylenecyclopropyl Radical Clock Substrates. ” J. Am. Chem. Soc. 2014, 136, 2944-2947. Lin, G.-M.; Choi, S.-H.; Ruszczycky, M. W.; Liu, H.-w. “Mechanistic Investigation of the Radical S-Adenosyl-methionine Enzyme DesII Using Fluorinated Analogs.” J. Am. Chem. Soc. 2015, 137, 4964-4967. Lin, G.-M.; Sun, H. G.; Liu, H.-w. “Study of the Uridine 5’-Monophosphate (UDP)-Galactopyranose Mutase Using UDP-5-Fluoro-Galactopyransoe As a Probe: Incubation Results and Mechanistic Implications.” Org. Lett. 2016, 18, 3438-3441. Jeon, B.-s.; Ruszczycky, M. W.; Russell, W. K.; Lin, G.-M.; Kim, N.; Choi, S.-H.; Wang, S-A. ; Liu, Y.-n.; Patrick, J.; Russell, D. H.; Liu, H.-w. “Mechanistic Studies of the SpnF-Catalyzed [4+2]-Cycloaddition in the Biosynthesis of Spinosyn A.” Proc. Natl. Acad. Sci. USA 2017, 114, 10408-10413. Lin, G.-M.; Romo, A. J.; Liem, P. H.; Chen, Z.; Liu, H.-w. “Identification and Interrogation of the Herbicidin Biosynthetic Gene Cluster: First Insight into the Biosynthesis of a Rare Undecose Nucleoside Antibiotic.” J. Am. Chem. Soc. 2017, 139, 16450-16453. Ko, Y.; Lin, G.-M.; Ruszczycky, M. W.; Liu, H.-w. “Mechanistic Implications of the Deamination of TDP-4-amino-4-deoxy-fucose Catalyzed by the Radical SAM Enzyme DesII.” Biochemistry 2018, 57, 3130-3133. Pan, H.-X. ; Chen, Z.; Zeng, T.; Jin, W.-B. ; Geng, Y.; Lin, G.-M.; Zhao, J.; Li, W.-T.; Xiong, Z.; Huang, S.-X. ; Zhai, X.; Liu, H.-w.; Tang, G.-L. “Elucidation of the Herbicidin Tailoring Pathway Offers New Insights into Its Structural Diversity.” Org. Lett. 2019, 21, 1374-1378.